7. But Wait, Not So Fast! Along with the excitement and anticipation of getting a new Mac comes the trepidation of reconfiguring it and moving all your data to the new machine. 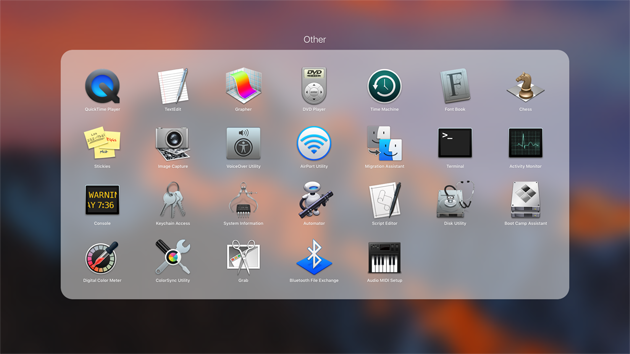 A wide array of folders and files make up a typical macOS configuration. Moving data from one machine to another is not as simple a task as many would would think. 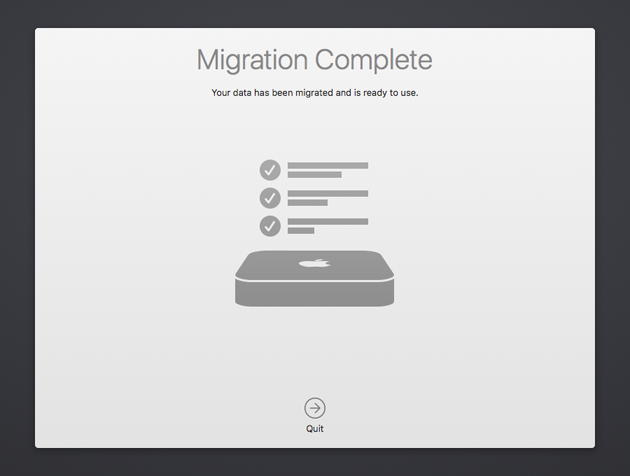 Apple realizes this problem and created a tool named Migration Assistant to make the job easier for you. One problem with using Migration Assistant, however, is that the process can be very time consuming. 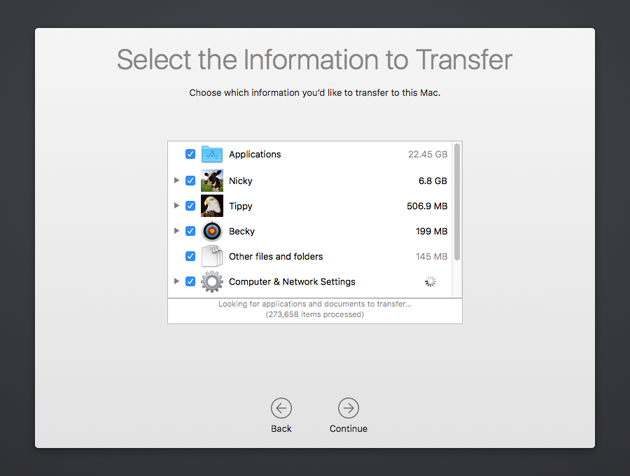 Unless you have a trivially small amount of data on your old Mac, you can expect to spend several hours — or maybe even an entire day — transferring information to your new machine. 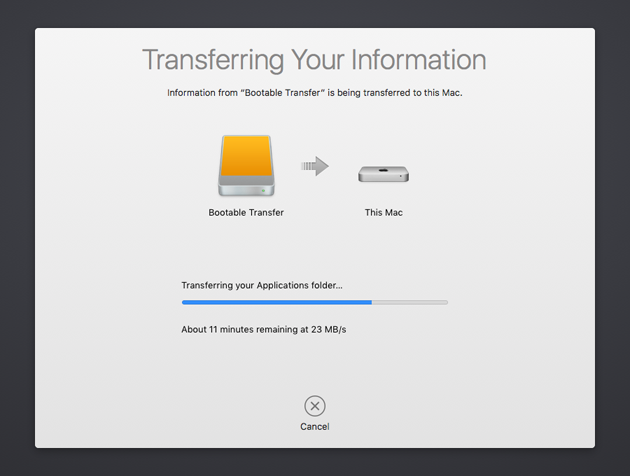 Fortunately, if you have a bootable backup of your current system, you can speed up the process of data transfer by migrating from your bootable backup rather than your old Mac. This performance improvement comes by virtue of the fact that transferring data from a locally attached hard drive is almost always faster than transferring across a network, especially if that network is wireless. You can expect the migration from a bootable backup to be anywhere from 2 to 10 times faster than doing so over a network. 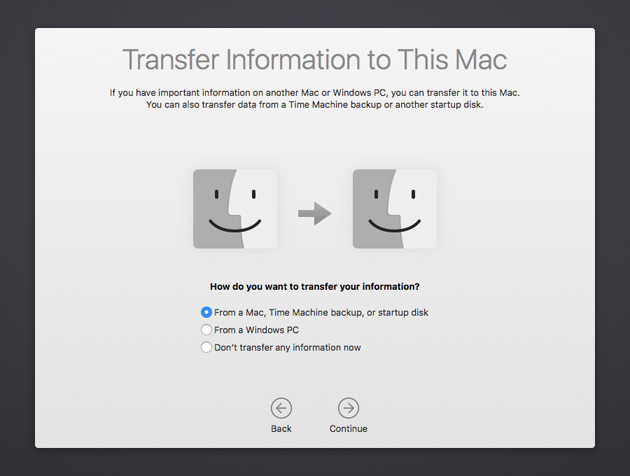 This guide takes you through the process of migrating to a new Mac via a bootable backup. It will show you how to prepare for and perform this task and what to expect once everything has been migrated. As an added bonus, you’ll have a backup of all your data and a good foundation for a backup strategy moving forward! Before starting your migration, it is a good idea to gather up serial numbers/license codes for any third party software that you may have installed. Many programs that require license keys do so in such a way that the key is associated with the computer that is running them. When you migrate to a new machine, those programs will consider themselves un-registered, so you will have to activate them again with the original serial number/license code. Since every application program is a bit different, this behavior is by no means absolute. 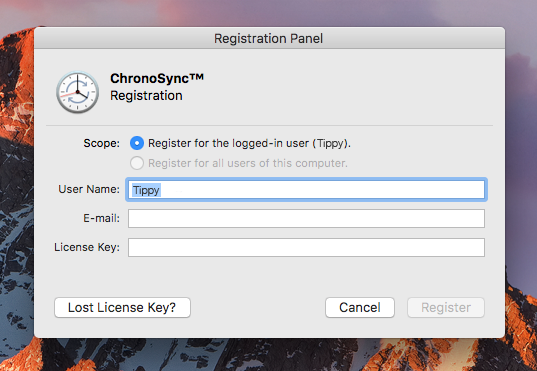 We CAN tell you with total confidence, however, that if ChronoSync and/or ChronoAgent are installed on the machine that you are migrating, you will need to re-register them on your new Mac. If these codes aren’t readily available to you, you can look them up now via our license code finder. You should create a temporary TextEdit document containing your license codes and save it on your desktop. It will come in handy later. To create a bootable backup, you’ll need an external hard drive attached to your old computer. 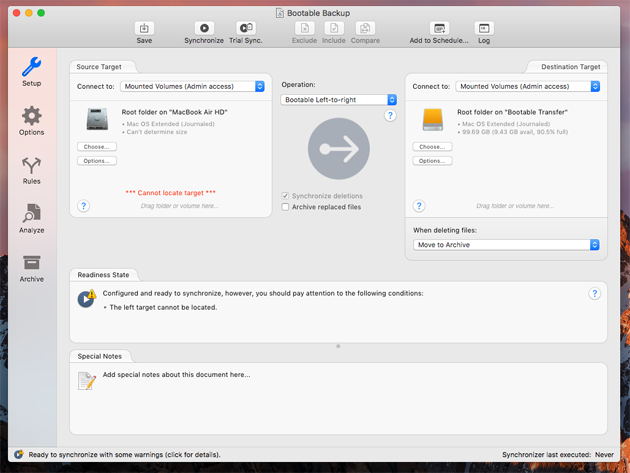 While this guide will not go through the details of creating a bootable backup, we do have another guide dedicated to the creating bootable backups. If you are doing this for the first time, you only need to follow that guide up to the point of running & testing your bootable backup (Step 8). You can then go back and read the other options and recommended practices presented in that guide after you have migrated to your new machine. If you have already configured a bootable backup on your old computer, go ahead and run it now. 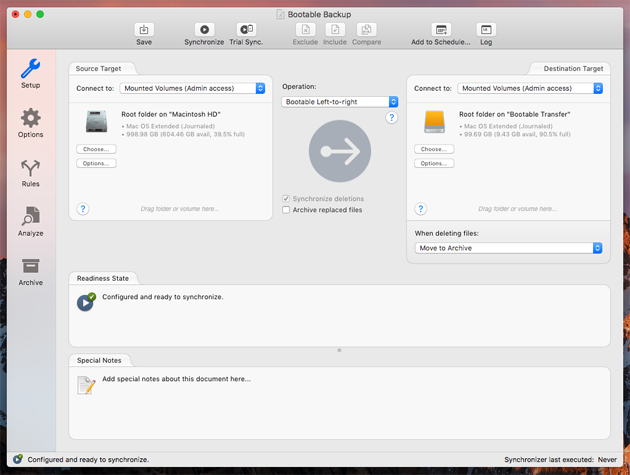 Note that while this guide assumes you are using ChronoSync for bootable backups (and we definitely prefer you do so, even if just in Trial Mode) you can actually use any one of the many fine tools available for creating bootable backups. The basic concepts presented in this guide apply no matter how you have created your bootable backup. 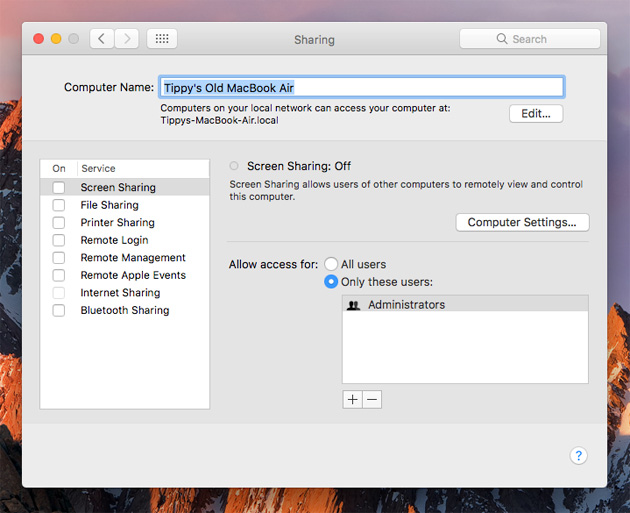 If you plan on continuing to use your old Mac on the same network as your new Mac, you’ll need to make some changes to avoid name conflicts between the two machines. If you have no intention of using your old computer again, you can skip this step. If a padlock icon appears at the lower left, click it and authenticate with your administrator credentials. You can then change the “Computer Name” field to a name that does not conflict with your new computer (or any other computer on the network). 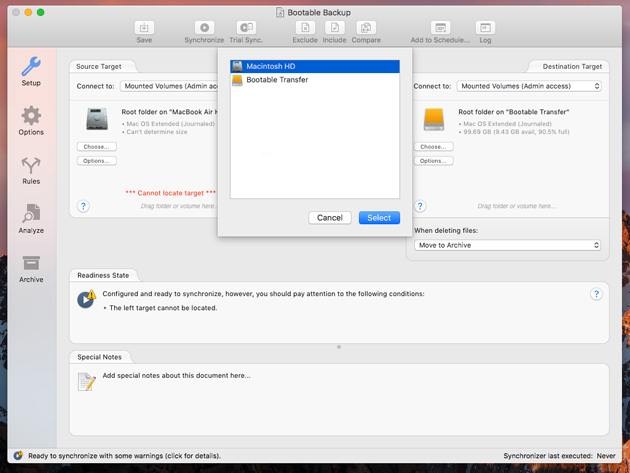 Close System Preferences at this point and you are done! Important: this step MUST be performed AFTER you run the bootable backup on your old computer. Otherwise, the new name for your old computer will be reflected in the bootable backup. Your new computer will use the same name! 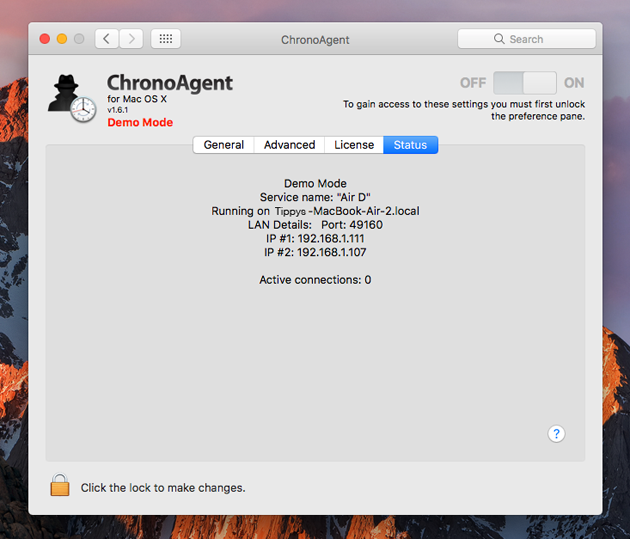 If you have ChronoAgent installed on your old computer and you intend to keep using your old computer on the same network as your new computer, you will want to rename your ChronoAgent to avoid conflicts on the network. If you don’t have ChronoAgent installed, or you have no intention of using your old computer again, you can skip this step. 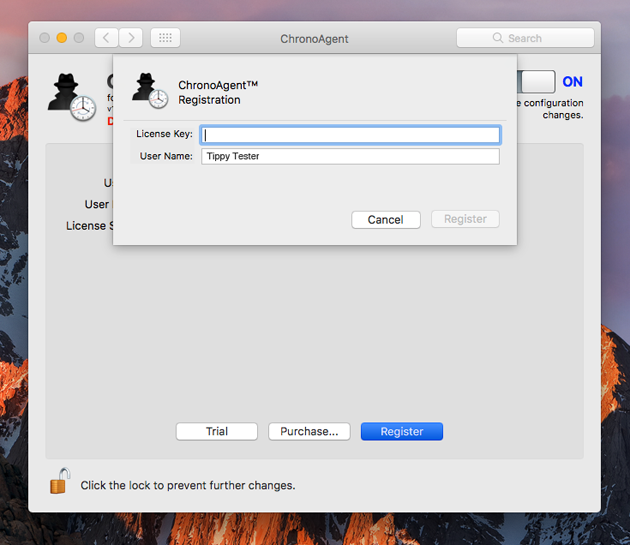 To rename ChronoAgent, open System Preferences on your old computer, click ChronoAgent and then select the “General” tab. Supply your administrator credentials so you can make changes. 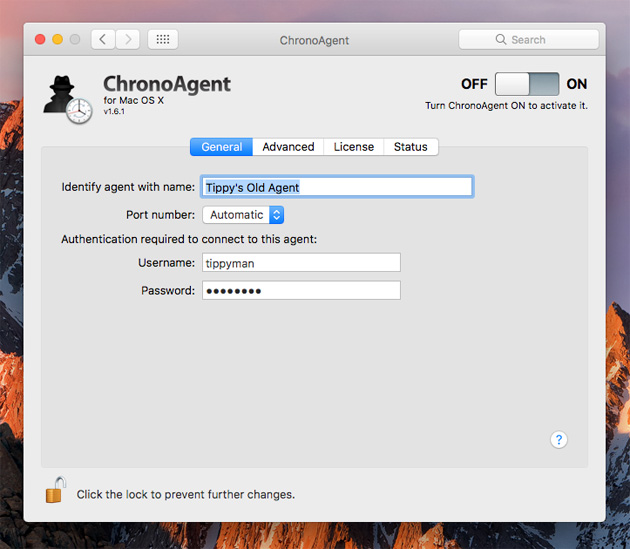 If ChronoAgent is running, you will need to stop it by turning OFF the big slide switch at the top-right of the window. Once this is done, you can change the name of your agent to something that does not conflict with your new computer (or any other computer on the network). When a new name has been entered, you can turn the agent back ON via the slide switch. 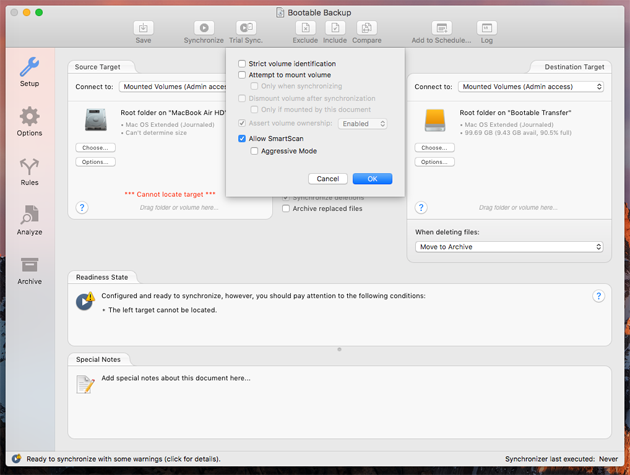 Close System Preferences and you’re done! Important: this step MUST be performed AFTER you run the bootable backup on your old computer. Otherwise, the new ChronoAgent name for your old computer will be reflected in the bootable backup. Your new computer’s ChronoAgent will use the same name! With the bootable backup complete and preliminary preparations out of the way, go ahead and shutdown your old computer (or unmount the bootable backup volume), disconnect the bootable backup drive and move over to your shiny new Mac! Important: this guide assumes that you have not fired up and begun using your new Mac yet. If you are well disciplined and have kept it in the box up until now, things will go so much smoother! 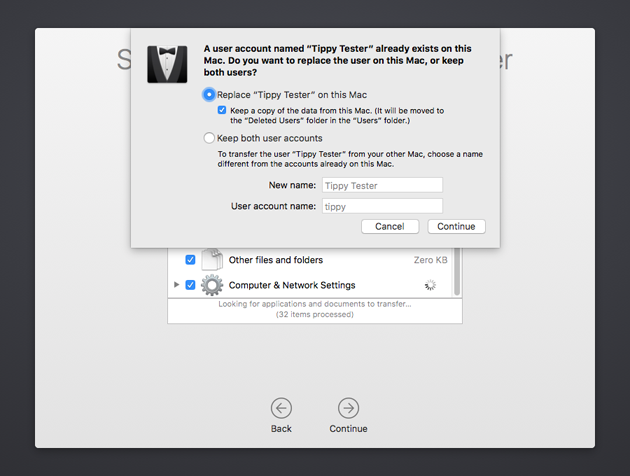 If you have already started up and configured your new Mac with an account, things will be a little more complicated. If so, you should skip ahead to Migrating After The Fact, then come back to this step once you have worked through that section. This could occur because, between the time your new Mac was manufactured and the time that you purchased it, a new version of iTunes was released and you updated it on your old computer. This is perfectly normal and you should choose to update the old software if such an option is presented to you. When you click “Quit”, your new system will continue booting but with your old system’s settings in effect. You should reach the login screen just like you normally would (or If your old system was configured to automatically login, your new system will do the same). You should login with your account and the configuration process will continue by asking a few more questions (typically license agreements, iCloud password, etc). Once you have made it through all the configuration questions, your new system is ready to go with a configuration more-or-less identical to your old system! This will only work if your volume names are the same. Otherwise you’ll have to click “Choose…” and re-specify your targets (we can’t do this in our example because the boot volumes are named differently). Note you only have to do this for targets that specify the internal drive of your old computer. If a target specifies a file server, ChronoAgent Mac or cloud service, they should work just fine without modification. Also, if a target specifies an external hard drive, it should work as long as that drive is attached to your new computer (as evidenced above since we did not need to change the Destination Target). 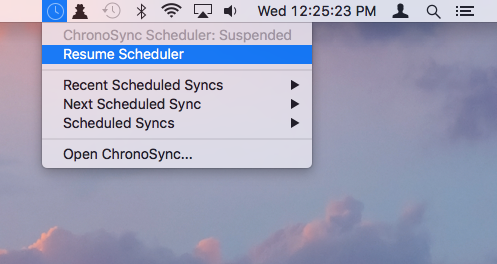 Once you have updated all your synchronizer documents to target your internal drive, everything should be ready to resume running your synchronizations. But first you should first spend a little time with your new Mac to make sure everything is in place and operational before running backups. If you fail to do this you run the risk of losing some of your backup data if things aren’t quite right with your new machine. If you collected your license codes and saved them in a text file on your desktop (as we suggested at the beginning of this guide), open that text file now and copy/paste your ChronoAgent license code in the field provided. After clicking “Register”, ChronoAgent will be fully functional and you may close the ChronoAgent Preference Pane. 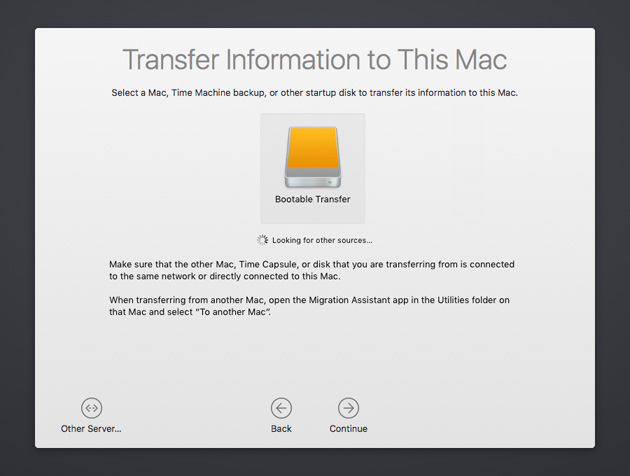 If your were impatient upon receiving your shiny new Mac and proceeded to boot it up and configure it, you can still migrate from a bootable backup of your old system. The procedure involves manually launching the Migration Assistant application and performing the transfer, much the same way you would have on initial boot of your new Mac. This approach is a little less ‘clean’ than migrating on initial boot, and some of our customers have encountered problems along the way. If you have not configured your new Mac yet, we strongly encourage you to invoke Migration Assistant on first boot as discussed above. When you click Migration Assistant, you will be informed that all applications will be terminated and that a logout will occur. If you proceed, you will be logged out and the very same Migration Assistant window as discussed above will appear. Here you must decide whether or not to replace the account your created on your new Mac with the same account as it existed on your old Mac or to create a duplicate copy of your old account. Unless you have performed a lot of work on your new account prior to migration, we recommend replacing the new account with the old version of it. After making this decision, click “Continue” and the process will be the same as documented above. 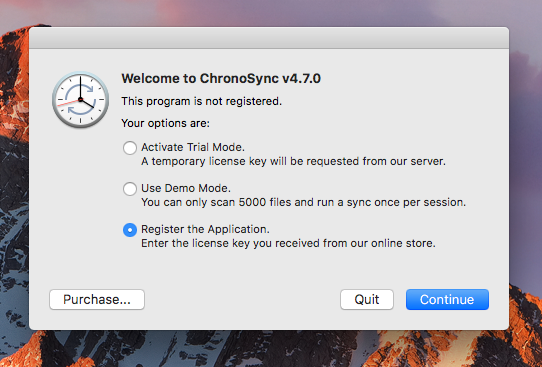 When the migration is complete and you finally reach a Finder desktop, we suggest a system restart before following the steps to reconfigure ChronoSync and ChronoAgent as discussed above. We’ve found that sometimes your system may be somewhat confused after the Migration Assistant has been tasked with re-configuring a previously configured system. A restart usually clears that up.